First of all, if you are familiar with LVM, there is noting special here. 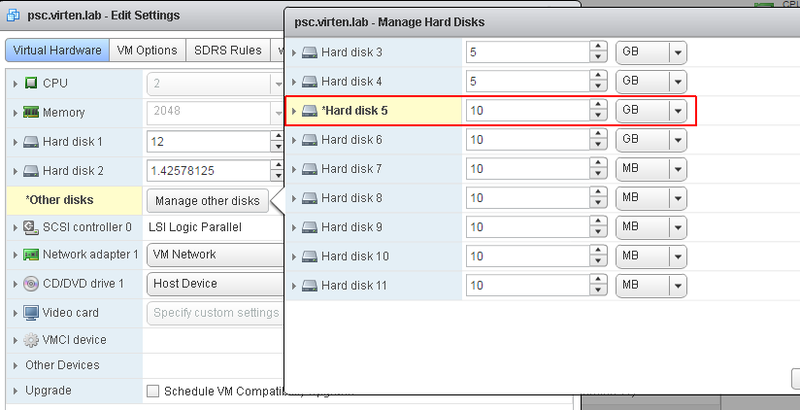 Just use the vSphere Client to grow the virtual disk (I recommended to grow the disk instead of attaching a new disk to extend the VG) and resize the Volume Group and Logical Volume. Use df -h to identify the filesystem that needs to be resized. In this exaple, it is the volume used for logs. Use the following table to identify the corresponding virtual disk. The vpxd_servicecfg command mentioned in KB2126276 is a shell script that calls functions from disk_utils.sh to automatically resize all volumes after resizing a virtual disk. The routine uses the same commands as explained above. log "ERROR: Invalid storage action ($ACTION)"
# expands LVs into new disk free space. tlog "INFO: LV Resizing $v"
tlog "INFO: Scanning Hard disk sizes"
# check for partitions, filesystem, swap directly on the device and LVM. tlog "INFO: Resizing PV $DEV"